Auburn Dam Watch is an effort to provide accurate, up-to-date information about the social and environmental issues that shape the debate over constructing the Auburn Dam. Spear-headed by All Outdoors California Whitewater Rafting, contributions include input from local scientists and environmental groups concerned with the well-being of California’s resources and people. The debate over the Auburn Dam can be divided into three main areas of concern: Public Safety, Water and Power Supply, and Recreation. Considering the earthquake threat posed by Auburn Dam, as well as the fact that Folsom Dam modifications and levee repairs are cheaper, faster-built and sufficient for any reasonably-expected future flood, public safety is better-served by focusing on these immediate concerns. Building new facilities and infrastructure is the most inefficient way of handling water and power supply issues. Inexpensive legislation, policy shifts, and farming techniques could decrease demand in 2030 by 8.5 million acre feet per year! 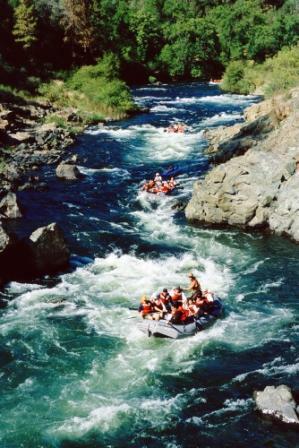 The American River canyons currently provide a recreation outlet for close to one million visitors per year. A dam at Auburn would significantly change the quality and type of recreation opportunities available.